As I discussed at some length here and here, VDOE does not report SOL scores for Maggie Walker. 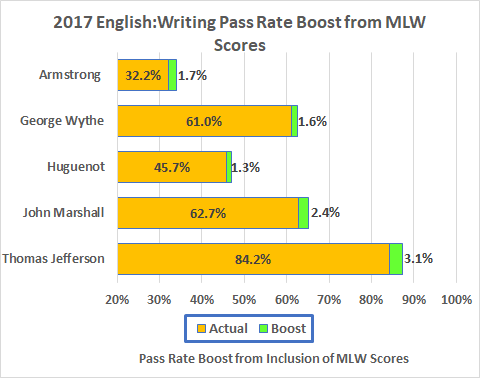 For reasons that have nothing to do with the truth, they report the scores of the MLW students at the high schools in those students’ home districts (Note: Old document; today Pearson surely reports the scores directly), albeit the MLW students are entirely educated at MLW, not at the schools where the scores get reported. Fortunately, the Board of “Education” has not been able to “adjust” the rules of algebra. So we can calculate estimate the score boosts the Richmond high schools enjoy courtesy of this mendacity. 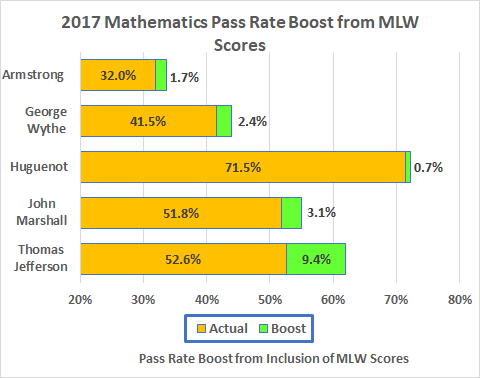 All it takes is the number of students at the high school, the reported pass rate, the number of those students who actually attend MLW, and the average pass rate at MLW. 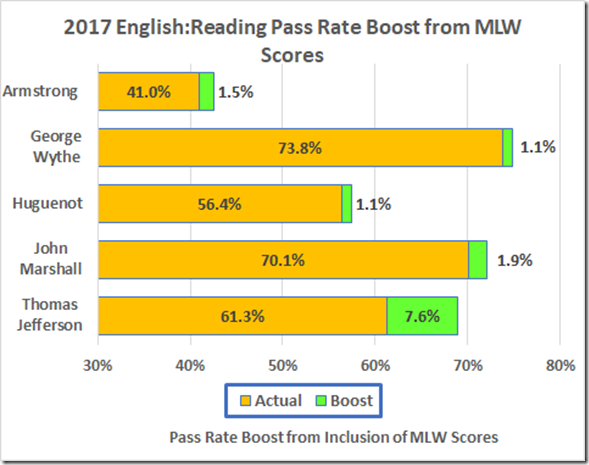 The first three numbers are available in the “school quality profiles” on the VDOE Web site (but I got the unrounded pass rates from the very nice VDOE database). 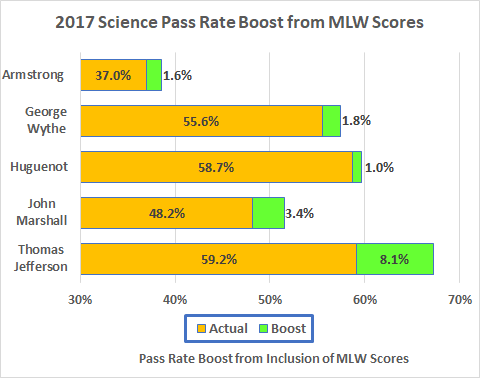 We can infer the MLW pass rates: The two selective Richmond high schools (Community and Open) run mostly at and otherwise near 100% and MLW is still more selective. 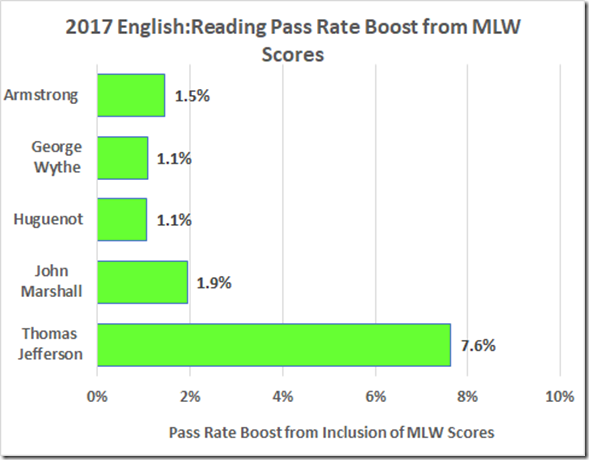 We’ll use a 100% SOL pass rate at MLW. Isn’t that nice! 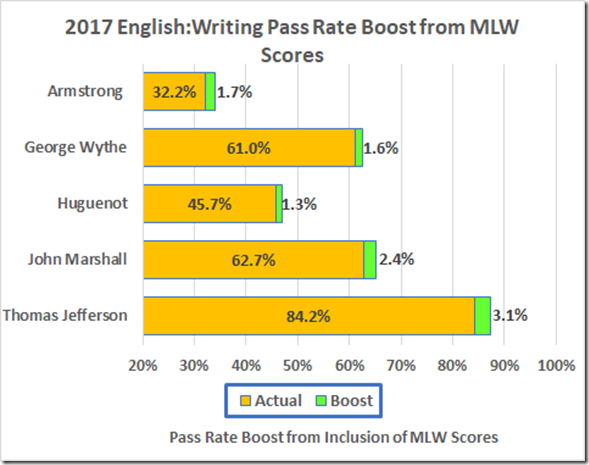 The TJ pass rate jumps from an actual 61.3% to the reported 68.9% courtesy of 133 MLW students who DO NOT attend TJ. The other score boosts are less dramatic but all in the helpful direction. While we’re at this, let’s look at the other subject areas. 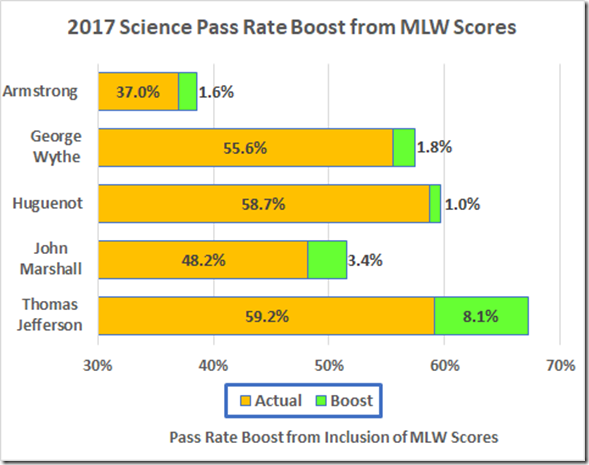 Do you suppose the feds know that the Board of “Education” is lying to them about these pass rates? 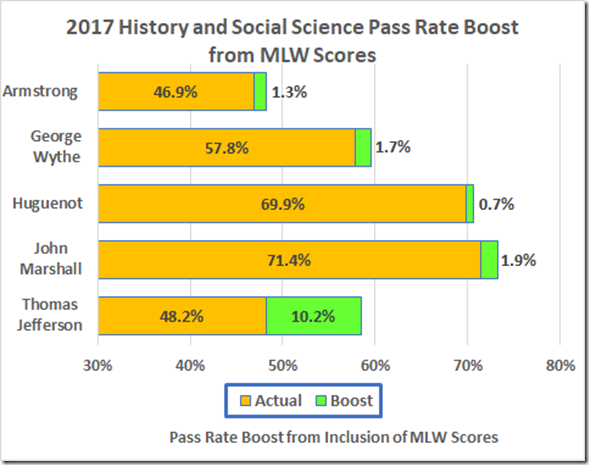 If you understood that the Accreditation numbers were rigged, do you now understand that, as to the high schools, the manipulation is still worse than you thought?